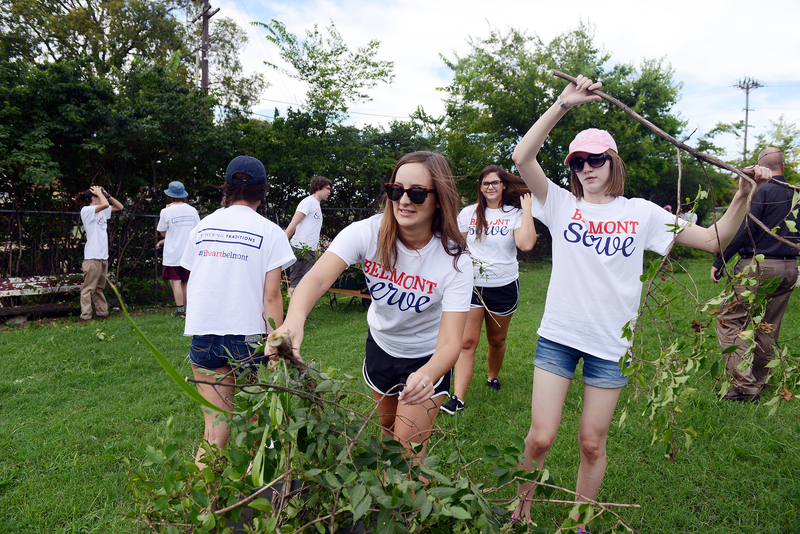 As students across the state are moving into residence halls, learning new procedures and having photos taken for campus IDs at orientation, more than 2,000 freshman and transfer students at Belmont University spent Monday afternoon participating in community service as part of the university’s annual SERVE. A tradition that’s marked Belmont’s orientation process for more than a decade, the event allows Nashville’s newest Bruins to spend time in their new home with their orientation groups. This year, students were spread out among 32 sites including Rocketown, Cumberland River Compact, SaddleUp! and Cottage Cove Urban Ministries. Before their dismissal into the city, participating students were welcomed by Director of Nashville’s Mayor’s Office of Diversity and Community Engagement Lonnell Matthews. Belmont’s President Dr. Bob Fisher also spent time speaking to the group prior to their send-off. New motion picture major and Nashville native Madison Eby served at Rocketown, a local concert venue and skate park that hosts events for youth. While there, Eby and her team completed a variety of tasks including painting and cleaning offices and the venue and organizing event flyers. As a native, Eby said she often overlooks opportunities to serve in her hometown, and the opportunity to participate in SERVE with her fellow Bruins was inspiring. Director of New Student Orientation Programs Ryan Holt said the choice to include a service component into students’ first week on campus is intentional. “Students are not just joining the Belmont community–they are joining the Nashville community. As we strive to be ‘Nashville’s University,’ we want students walking away from their college experience with a better understanding of what it means to be an upright citizen of both Belmont and Nashville,” he said.